The SpaceX Dragon capsule splashes down in the Pacific Ocean Oct. 28, 2012 after its first caro delivery mission to the International Space Station. WASHINGTON — About two days after splashing down in the Pacific Ocean, a commercially operated space capsule laden with 760 kilograms of return cargo from the international space station arrived at port in San Pedro, Calif., in the early morning hours of Oct. 30. Space Exploration Technologies Corp. (SpaceX) recovered its Dragon space capsule Oct. 28, the same day the craft departed the space station. Dragon splashed down about 400 kilometers off the coast of Baja California, Mexico, with a cache of cargo including items belonging to NASA and its international space station partners. The ship carrying Dragon docked around 3 a.m. local time, SpaceX spokeswoman Katherine Nelson said in an Oct. 30 email. Dragon’s return is a milestone in NASA’s effort to turn space station cargo logistics over to private operators. 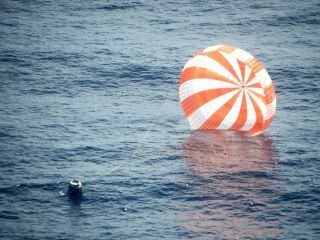 The craft’s splashdown marked the completion of the first mission under Hawthorne, Calif.-based SpaceX’s $1.6 billion Commercial Resupply Services contract signed with NASA in 2008. SpaceX has 11 more missions to fly under that contract. Dragon launched Oct. 7 aboard SpaceX’s Falcon 9 rocket from Launch Complex 40 at the Cape Canaveral Air Force Station in Florida, carrying 400 kilograms of cargo including crew supplies and research hardware. Despite the loss of one of the rocket’s nine first-stage engines 79 seconds after liftoff, Dragon reached the international space station Oct. 10 as planned. However, the engine anomaly, which is still under investigation by a joint NASA-SpaceX team, forced SpaceX to jettison a secondary commercial payload into a lower-than-intended orbit. The payload, an experimental satellite that belonged to Fort Lee, N.J.-based Orbcomm, subsequently fell out of orbit, that company announced Oct. 11. SpaceX is one of two companies with contracts to fly cargo to the international space station. The other, Orbital Sciences Corp. of Dulles, Va., is now expected to begin routine delivery missions sometime in 2013. Orbital still has two demonstration flights to complete before it can begin fulfilling its own $1.9 billion delivery contract with NASA. The first of those flights, a test of the company’s Antares medium-lift rocket without the Cygnus cargo capsule, is supposed to take place this year.